What better way to say thank you to all of my readers than to host another giveaway, right? So what's in Budget Biyahera's Goodie Bag? Let's see! 1) Anyone who has a Philippine address can join. 2) You must also have VALID and ACTIVE Facebook and Twitter accounts to participate. 3) You must follow the mechanics that are provided on the Rafflecopter below to gain your entries. 4) You can earn more entries by fulfilling daily yet OPTIONAL tasks to increase your chances of winning. Joining is easy and most certainly FREE. All you need to do is to follow the mechanics posted on Rafflecopter, earn more entries every day, and share the giveaway details to your friends on Facebook and Twitter! Oh.. please don't forget to send/attach the Tweet & Facebook URLs on Rafflecopter after you share the giveaway via these social media options. The link to the URL should look like this when I check on my Twitter & FB wall: *SAMPLE URL for TWITTER and FACEBOOK. Please note that wrong url attachments will be disqualified. I want to discover the secret beaches & different places that I've never been. I love reading magazines about travel, it's my dream to travel all over the world. Want to travel with my Family. I'm looking for good destinations, and beautiful escapades here in our country. And taste the most delicious and mouth watering food in country! i like to travel, whether with my family or friends or even alone sometimes (i like the thrill and adventure of exploring places alone). Since its already the ber months and the holiday is fast approaching this will be perfect for the trip. To add i might get some new ideas where we could go this year somewhere new and fun as well. i want to win this since it's been a long time since my last travel. I want to win because my son loves to travel and I would like to share some of the prizes with him. I love reading magazines and I love to travel. I want to win because I really love to travel, and I have a lot of travels next year. I want to win this because i love to travel and those magazines would be a great help in my plan to trave. I want to win because i love travelling and this is the great opportunity for me if given a chance or if im the lucky one.. I love reading magazines especially travel magazines. Every time I read, it brings me to some beautiful places. Hopefully one day, it will be real. I love reading travel magazine. I may not be an adventurous person but at least in this way I can still explore the world. I want to win this goodies because i love to travel and this may helpful for me..
Wow that's really a great treat for your followers and I'm sure they'll get to love to read all the travel mags especially the one where your postcards contribution is included. I want to win these goodies because I can give it to my son who will go on camping next month. I want to win because I collect magazines and pouches/purses. We want to show our appreciation and thank you for your giveaway this season! Congratulations! Here's to more years of traveling and blogging! 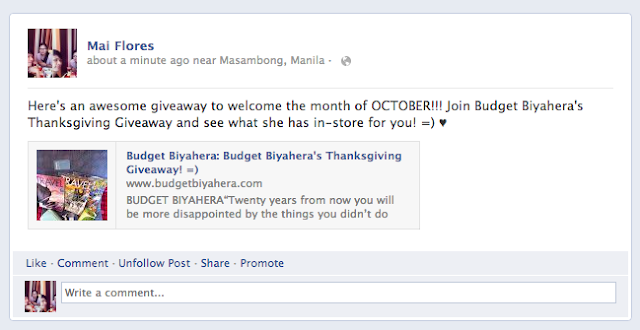 :) Will try to join too nd include pinas address, woooottt!!! I want to win this because I really love travel magazines! I collect magazines because travelling is my passion.. I want to win this because I really have passion for travelling, since I can't visit all the beautiful places, i would just settle in magazine features.. I want to win these so I can use them in my future fun travels! I want to win these AWESOME TRAVEL GOODIES because I have a sister that will really loves this. So in case I won, ill gonna give it to her. I want to snag these travel goodies because our family loves going places. 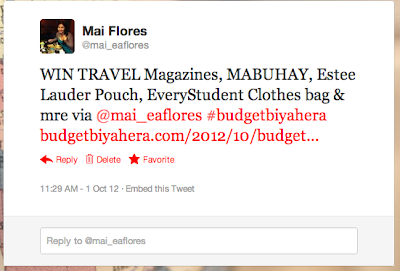 I want to win those amazing travel goodies because I could use all the travel tips and goodies for my future travels! God bless you! oppss..i forgot my email - leizledemaisip@yahoo.com thanks! Travel magazines inspires me to imagine and dream of places I've never been. It allows me to see glimpses of the beautiful and wonderful places from all over the world. Should you have no access to the internet, it's additional reference for useful trips during travels and helps you plan out your trip, I would often take home the magazines from the plane when I travel. Hehe.. not sure if it's illegal or not but nobody complains nor was I ever reprimanded by the plane attendants. I want to win them because i love traveling as much as i love eating nutella! Haha! I love travelling. I'm sure that these magazines will help me and my friends in our next travel. I would like to win these goodies for my future travel. These would e helpful to see the nice places to visit and be updated for the latest budget and exciting offer for travelers. I want to win so have a great knowledge on traveling and reading it inspires me to explore the world and blog about it. I want to win the giveaway because i want to see more places via magazines and some inputs about the place and to have an idea of it before i go to that place. I want to win this because love to plan & travel while reading this magazine! Hi. I wonder why my comment days ago didnt appear here. So I commenting again.. I love reading materials..anything and especially travell magazines. it makes me wander to places I want to go someday.